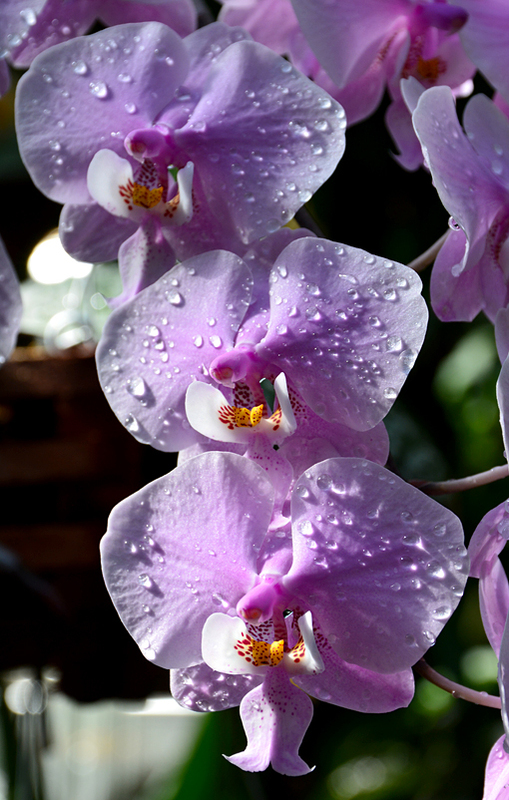 A world-class exhibition, Orchid Daze: Nature's Wonders at the Atlanta Botanical Garden is magnificent! It's on display through Sunday, April 10, but go soon so you can so you can also see the hundreds of thousands of magnificent spring blooms throughout the 30-acre Garden! 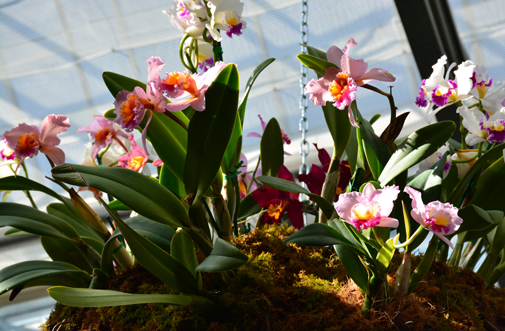 There are events associated with Orchid Daze, including one more Orchid Market Weekend, hosted in the Visitor Center—the next one is Saturday and Sunday, April 9-10. 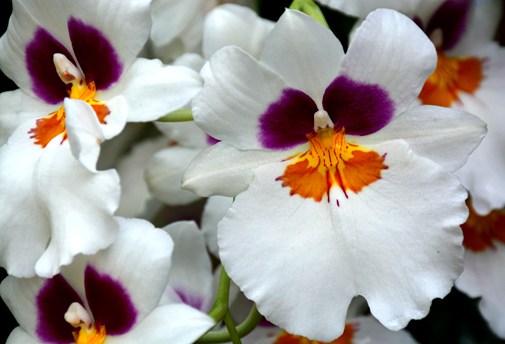 There's another Orchid Care Clinic coming up on Saturday, April 9, from 10:00 a.m. to noon, reservations required. Also going on right now is the annual Atlanta Blooms! exhibition featuring hundreds of thousands of blossoming tulips, daffodils, crocus and more! Having had a mild winter, you'll want to get to the Garden to see all the blossoms on the earlier side this year. My first visit to this year's Orchid Daze exhibition was also the first time I'd been to the Garden since December (cue: dropped jaw) and it was the first day of spring, one of the most anticipated dates on my calendar! I know, I know...why hadn't I been to the Atlanta Botanical Garden in so long? I had an extremely busy winter, but I was amazed and delighted at how refreshed everything at the Garden seemed. The Fuqua Orchid Center is manicured more than I ever recall it being, but not to the point that it seems unnatural...it's quite stunning. If you're a first time visitor you should know that the Orchid Daze exhibition is displayed in three distinct areas. The introduction to the exhibition is in the lobby of the Fuqua Conservatory, which leads into the Tropical Rotunda. I overheard a visitor in the Conservatory lobby on this particular visit ask is wife, "Is this all?" She excitedly informed him that there was more. 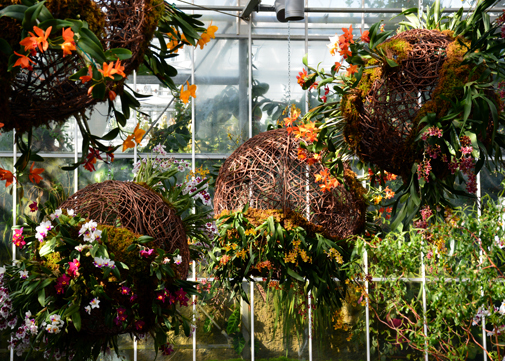 After meandering through the Tropical Rotunda—which is absolutely stunning!—the Orchid Daze exhibition continues in the lobby of the Fuqua Orchid Center. AND it continues further in the adjacent Orchid Center Display Room. 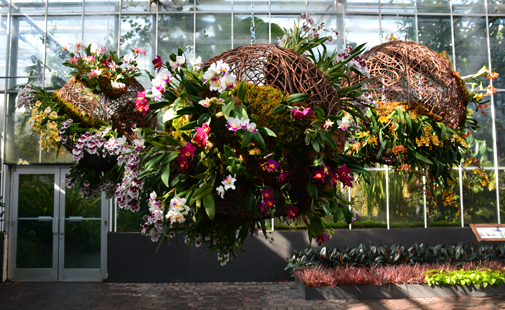 Be sure to visit the High Elevation Display Room, also adjacent to the Orchid Center lobby. 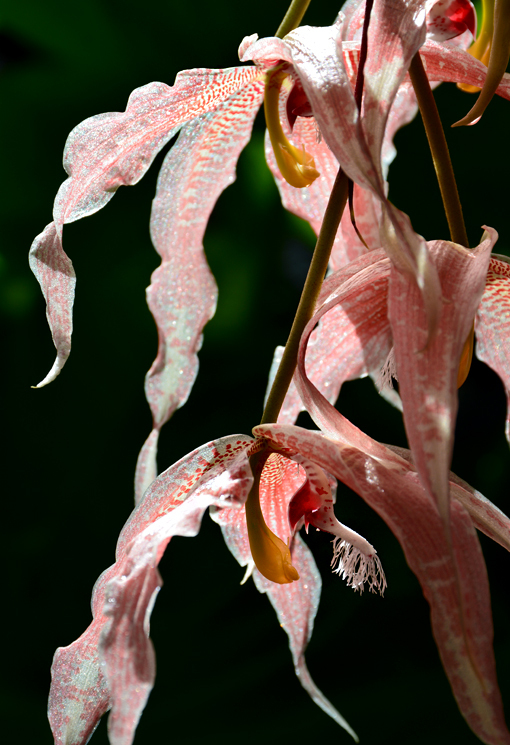 If you're an avid orchid enthusiast I highly recommend subscribing to The Orchid Column, the Atlanta Botanical Garden's orchid blog written (and filled with gorgeous photography) by Fuqua Orchid Center Manager Becky Brinkman...it's an awesome blog! Oh, and be sure to read the "How We Did It" post, which discusses the execution of this year's Orchid Daze exhibition! In recent years the Orchid Daze exhibition has been themed after various artists (2015, 2014, 2013) and they've been magnificent, but this year's show is particularly exceptional! While these orbs presumably represent "worlds", being the space geek that I am, I saw an orchid constellation, so of course I Googled "constellations named for orchids". In my brief search I didn't find any, but I did come across Greek guitarist Andreas Kapsalis who performs "Orchid Constellation" in this video. Having lived in Greece listening to Greek music for more than two years, this was a treat. On this particular visit I renewed my Garden membership—I've opted for the dual membership for quite a few years now, so that I may bring a visitor who gets to enjoy the Garden as my guest and then goes and shares with everyone they know just how remarkable and spectacular it is. This is the Atlanta Botanical Garden's 40th anniversary, so there's a LOT of fantastic programming going on. If you've ever considered becoming a member, this is the year to do so. We went earlier in the morning and the lighting was prefect! If you can arrange an early visit and you're a shutterbug, you'll appreciate the early day light as much as I did. When we were at the Garden to see Orchid Daze the Atlanta Bonsai Society was hosting their annual show in Day Hall. It's always been a fantastic show, but this year was exceptional! From the entries to the way they were displayed, I was thoroughly impressed! I made a few photos with my phone, but none to share here, sorry. Be sure to mark your calendar for next year's show! I love the color yellow! 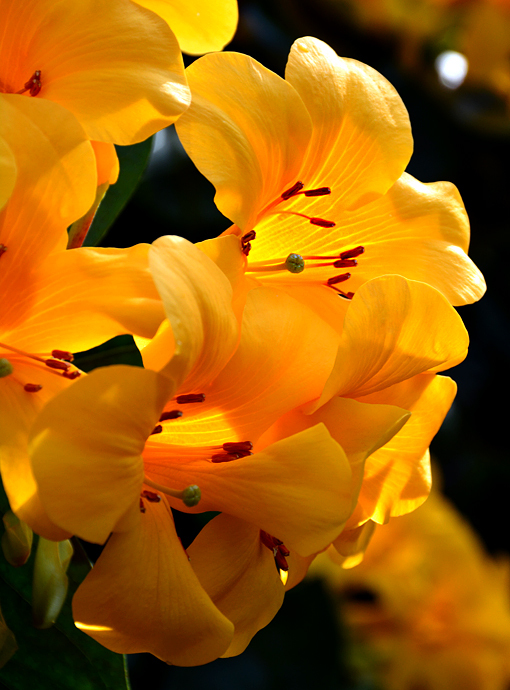 Dark red is my favorite color of all, but yellow has been a lifelong favorite, too. 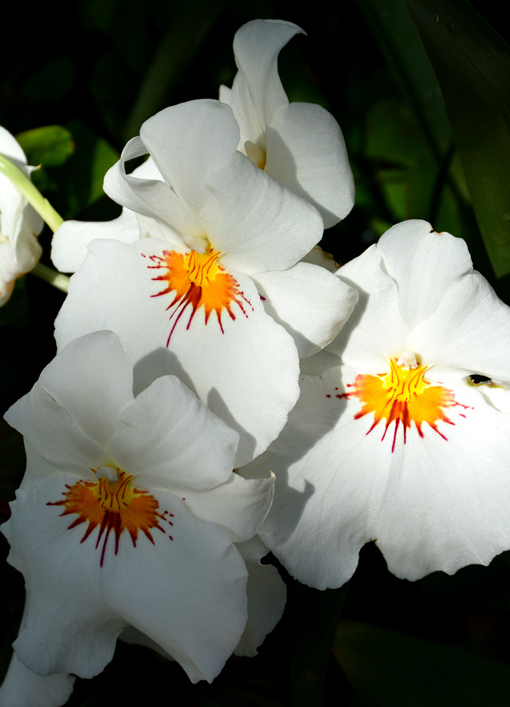 The flower pictured above is not an orchid, but it's one of the many, many non-orchid flowers in the Fuqua Orchid Center. 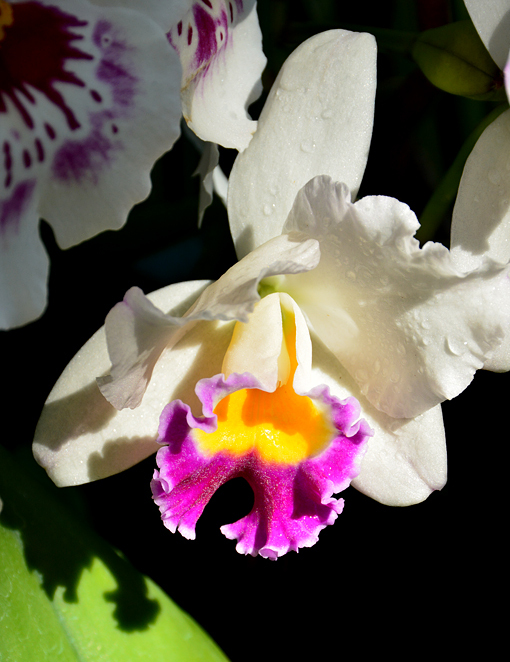 That's to say that the flora in the Orchid Center is as diverse as the species of orchid. 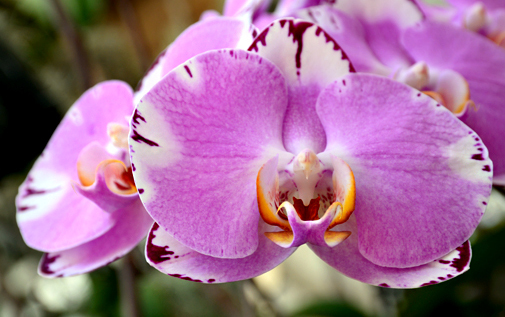 Orchid Daze: Nature's Wonders at the Atlanta Botanical Garden is on display through Sunday, April 10. It's free with admission! Be sure to make time to explore the full 30 acres of our magnificent Garden! Western wildflowers have an intriguing history. Perused about the utilizations and environment of western wildflowers including beargrass wildflowers, bitterroot wildflowers, owl-clover wildflowers, Indian paintbrush, snowberry wildflowers and the yucca blossom. Orchids are paradigms of love. They represent sole purification, peculiar beauty and unequaled fondness which determine the bride's femininity and womanly face of life. With spring in full flow, the daffodils in bloom and blossom beginning to show on the trees, many of us will be looking forward to the warm, sunny haze covering our gardens during the Easter weekend.